The first time I heard of the entrepreneurial past of the KGP alumni, I was speechless. This remote place in a corner of eastern India could generate such stupendous success was beyond imagination. Over my stay at IIT Kgp, I got used to this and started harboring dreams of my own. We all know that entrepreneurship is a difficult path to take. However as Robert Frost said, "I took the one less traveled by, And that has made all the difference." It is these guys among us, who made, are making, and will make the difference. In it's own small way, IIT Kgp Technology Alumni Association Bangalore chapter is celebrating this cause and in the process wants to reach out to all those who just started their entrepreneurial journey. 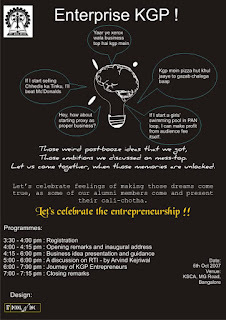 We are organizing an Event "Enterprise KGP " on 6th of October 2007. The venue for the event is "Chinaswamy Stadium" (KSCA) in Bangalore. There will be a panel consisting of Kgp alumni, who are into VC funds, successful entrepreneurs themselves, and other people, who can help you with your venture. If you have just started out and looking for that "big" opportunity this is it. Since time is a constraint we can accommodate only a few companies. So rush in your entry here or leave a comment/mail to me. Some more information about the event can be found at the IITKgp Bangalore blog. For others this is a great opportunity to catch up with what Kgpian's are doing and see how you can benefit from their ventures. It can be a strategic partnership, an investment opportunity, a challenging job opportunity, or just a bhat session the old way. The poster for the event is designed by Mukesh (2002 Batch), whose company "PixelnInk", I featured in this post . If you are looking for creative folks to help advertise your business, this is the company to approach. All the Kgp readers of this blog, this is our event. Spread the word and let's celebrate the success of all those who dared to take the path less traveled.